The base year considered for the research study is 2015 and the market size forecasted is from 2016 to 2021. Factors such as growing trend towards mobility and Bring Your Own Device (BYOD), continuous service support, low cost of ownership, and pay-per-use model are expected to boost the growth of the market during the forecast period. The objective of the report is to define, describe, and forecast the UCaaS market on the basis of segments which include component, organization size (small, medium, enterprise and large enterprises), industry vertical, and region (North America, Europe, Asia-Pacific, and Latin America) and also to provide detailed information regarding the major factors influencing the growth of the market (drivers, restraints, opportunities, and challenges).The report strategically profiles key players and comprehensively analyzes their core competencies. This report also tracks and analyzes competitive developments such as mergers and acquisitions, new product developments, and Research and Development (R&D) activities in the UCaaS market. The UCaaS ecosystem comprises unified communication service providers, such as Cisco Systems (U.S.), 8x8 (U.S.), West Corporation (U.S.), Microsoft Corporation (U.S.), Voss Solutions (U.S.), Star2star Communications (U.S.), and Polycom (U.S.); system integrators such as Siemens Corporation (Germany) and Wipro Limited (India); and enterprises such as Verizon Communication (U.S.) and BT Group (U.K.). Other stakeholders of the UCaaS market include consulting service providers such as Computer Science Corporation (U.S.) and collaboration providers such as NTT Communication Corporation (Japan) and Avaya, Inc. (U.S.). 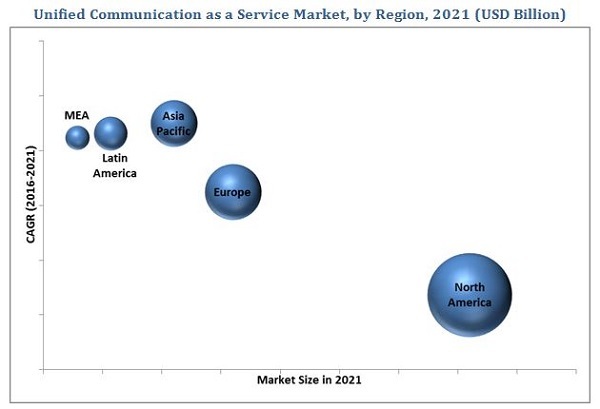 MarketsandMarkets forecasts the Unified Communication as a Service market size to grow from USD 17.35 Billion in 2016 to USD 28.69 Billion by 2021, at a Compound Annual Growth Rate (CAGR) of 10.6%. Growing trends towards mobility and Bring Your Own Device (BYOD) are some of the key factors driving the UCaaS market. Other driving forces include the growing need for operational efficiency and cost savings. The UCaaS market is broadly classified by component, organization size, industry, and region. The component segment is further divided into telephony, unified messaging, conferencing, collaboration platform & applications. The collaboration platform and application segment is expected to grow at the highest CAGR during the forecast period; collaboration platform and application in the component segment is projected to witness a high demand owing to its special feature of improving business processes with advanced digital transformation. Organizations are rapidly deploying unified communication solutions to get a world-class infrastructure of communication. The demand for unified communication solutions is increasing due to the cost-effective and time-efficient features of cloud; the demand by businesses segment is expected to grow at the highest CAGR during the forecast period, due to their requirement for cost-effective solutions. Consumer goods and retail holds the largest share of the Unified Communication as a Service market in 2016. The growth is fueled by the real-time services of UCaaS to streamline the business processes. The travel and hospitality vertical is expected to grow at the highest CAGR during the forecast period due to the increasing adoption of web and mobile-based business applications for world-class communication network across the globe. The global market has been segmented on the basis of regions into North America, Europe, Asia-Pacific (APAC), Middle East and Africa (MEA), and Latin America to provide a region-specific analysis in the report. The North American region, followed by Europe, is expected to become the largest revenue generating region for UCaaS service providers in 2016. This is mainly because in the developed economies of the U.S. and Canada, there is a high focus on innovations obtained from research and development and technology. The APAC region is expected to be fastest growing region in the Unified Communication as a Service market. The growth in this region is primarily driven by the growing trends of mobility and BYOD. The UCaaS market faces challenges such as lack of awareness about unified communications in some geographical regions. Factors such as security issues are the obstacle to market growth. Major service providers offering unified communication services across the globe are Cisco Systems (U.S.), Computer Science Corporation (U.S.), BT Group (U.K.), 8x8 (U.S.), West Corporation (U.S.), Microsoft Corporation (U.S.), Voss Solutions (U.S.), Verizon Communication (U.S.), Star2star Communications (U.S.), and Polycom (U.S.). These vendors have adopted different types of organic and inorganic growth strategies such as new product launches, partnerships & collaborations, and mergers & acquisitions to expand their offerings in the Unified Communication as a Service market.